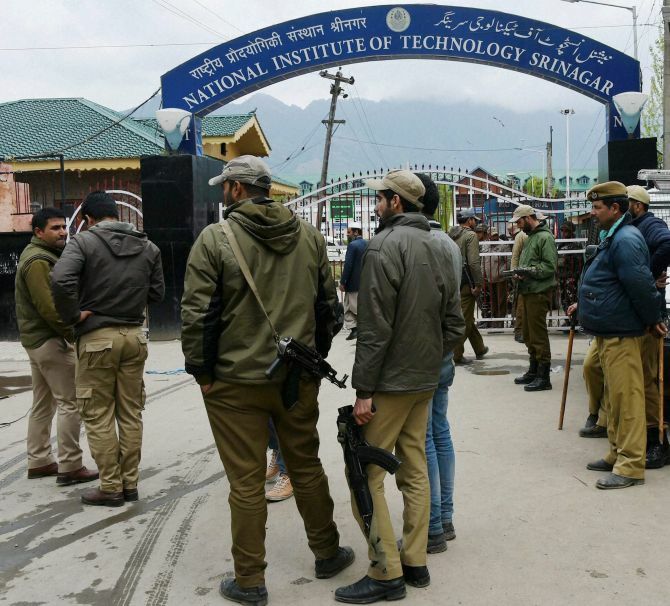 Human resource development ministry officials have rejected the demand of outstation students of NIT Srinagar for shifting the institute out of Kashmir but assured them of addressing their “genuine” issues. A group of outstation students of the NIT met Deputy Chief Minister Nirmal Singh and Education Minister Naeem Akhtar along with officials from Union HRD ministry on Friday night to discuss the situation at the institute. “The demand for shifting the NIT out of Kashmir has been outrightly rejected by the HRD ministry officials. It has been made clear to the students,” official sources said. The sources said the ministers and HRD officials however assured the students that their genuine demands like better amenities inside the campus and improving the academic atmosphere will be addressed. “The Board of Governors of the NITs will be meeting on April 11 where all these issues will be addressed,” the sources said. They said the ministers told the students that security has never been an issue at the NIT but the state government will ensure that concerns on this front will also be addressed. “The ministers asserted that students of the institute have been here at the peak of militancy and no one has ever been harmed,” the sources said. Meanwhile, an official of the NIT said the meeting was a positive development as the situation inside the campus was improving. The situation is calm but the outstation students are seemingly still on protest, Registrar, NIT Srinagar, Fayaz Ahmad Mir said. Mir said as there were no protests at the campus on Saturday morning. The students are in their hostels as there was no class work as Saturday and Sunday are off days, he said. The registrar said it was a positive point that there was no confrontation between non-local and local students. There have been no group confrontations and that is a positive point, the registrar said. He said the administration has been approached by few injured students who want to go home and as per the directions of the Union HRD ministry, arrangements are being made for them. Remaining students, who want to go, may also submit their details so that necessary action may be taken, he said. Chairman, Board of Governors, M J Zarabi has appealed the students to help restore normalcy at the campus and help the institute scale great heights. “I have been very distressed at the recent turn of events at this institute. As chairman board of governors NIT Srinagar, my dream and indeed my endeavour would be to see the institute improve its standard, excel at least in certain areas and improve its rating further,” Zarabi said in his appeal to the students.